Miranda Burruano, 18, of Orchard Park, NY had happy tears after capping off her junior equitation career with a win in the 2018 Jump Canada Medal National Final on Nov. 6 at the Royal Horse Show in Toronto, ON. Riding Quioxte, her 12-year-old Oldenburg gelding sired by Quidam de Revel, Burruano returned to the National Final after finishing second in 2017. Winning the 2018 title proved extra special, as it allowed Burruano, who will age out of the junior level in 2019, to cap off her equitation run on a high note. Burruano was one of the last to go in initial jumping round from the field of 25 top equitation athletes invited to compete in the Final from four Regions across Canada (Atlantic, Ontario, Prairie and British Columbia). A smooth trip around the 12 obstacles, which included broken lines, short turns and a challenging, airy two stride set right up against the stands, bought Burruano her ticket as one of the top eight invited forward to the flat phase. During the flat phase, which was worth 40% of the judges’ marks (with the other 60% decided in the jumping phase), Burruano’s equitation skills were on display at the walk, sitting and rising trot, and canter. Once again, she was one of the judges’ top picks to move forward, this time to a final jumping test for the top four athletes. “I was sitting in third going into the final test, and I thought I would probably stay third or fourth after that ride-off,” said Burruano, who exceeded her own expectations and shot into the lead with a foot-perfect final test over the shortened course that asked riders to demonstrate their skill in jumping from a counter-canter and trot. Burruano was joined in the final test by stiff competition, including 2017 Jump Canada Medal National Champion, Sam Walker, 16, of Nobleton, ON aboard Willem, owned by Nicole Loochtan. Fresh off an impressive win in the 2018 ASPCA Maclay Championship – a prestigious American equitation series final held on Nov. 4 at the National Horse Show in Lexington, KY – Walker led the pack during the jumping and flat phases and was the last to perform the final test, where a slight bobble at a skinny wall edged him into finishing as the Reserve Champion. Rounding out the top three was Ellah Dubeau-Kielty, 15, of Burlington, ON who persevered in challenging circumstances when the fire alarm system went off during her jumping round. 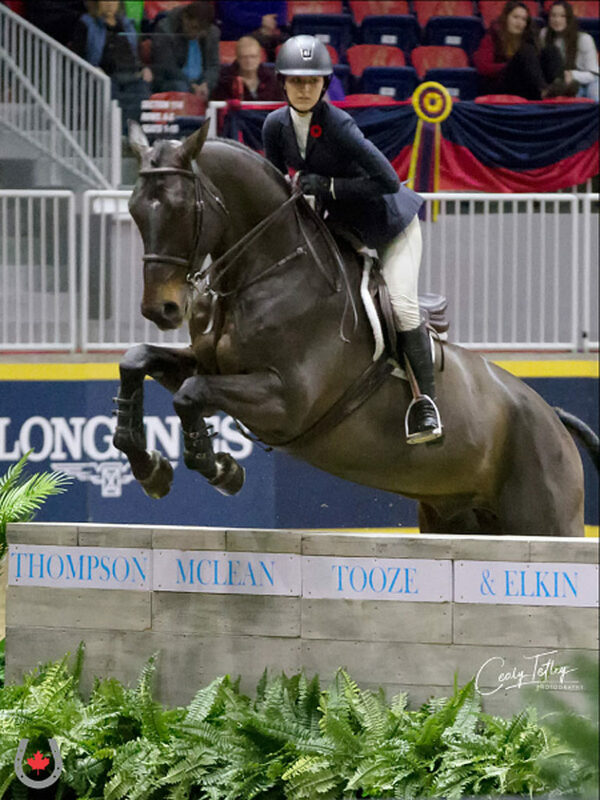 Despite the distraction of the loud siren and flashing lights in the Coca-Cola Coliseum, Dubeau-Kielty had a masterful round aboard Cupidon (Dollar de la Pierre x Equador), an 11-year-old Dutch Warmblood gelding owned by Mark Hayes and Dave Hanley. Fourth place went to Mikayla Brabant, 17, of Chestermere, AB aboard Cortofino, a seven-year-old Hanoverian gelding owned by Spruce Meadows Ltd.
As the 2018 Champion, Burruano was awarded the Leslie P. Usherwood Memorial Trophy, as well as a plate donated by the Usherwood family. She also received a jacket from the Equestrian Canada (EC) Jumping Committee, which also donated a cooler to the top four riders. Looking ahead, Burruano is now focused on her next challenge at the Royal Horse Show, the 1.20m Junior Jumper division, which kicks off on Nov. 8. Jumper is a passion for Burruano, and one that she wants to focus on in 2019 after aging out of the junior division. At the Royal she will be partnered with D’Ophelia, a 10-year-old Dutch Warmblood mare by Balou du Rouet Z that stands just 15.3hh. For full results from the 2018 Jump Canada Medal National Final, visit www.royalfair.org. 4th / Mikayla Brabant / Chestermere, AB / Cortofino / Spruce Meadows Ltd.